It all started when we got back from Knin, a beautiful town in Croatia, where the Trout World Championship from shore took place. Me and Andrei, were the captains of the Romanian Spinning Team. The best thing about a World Championship is that you get to compete, watch and learn from the best. 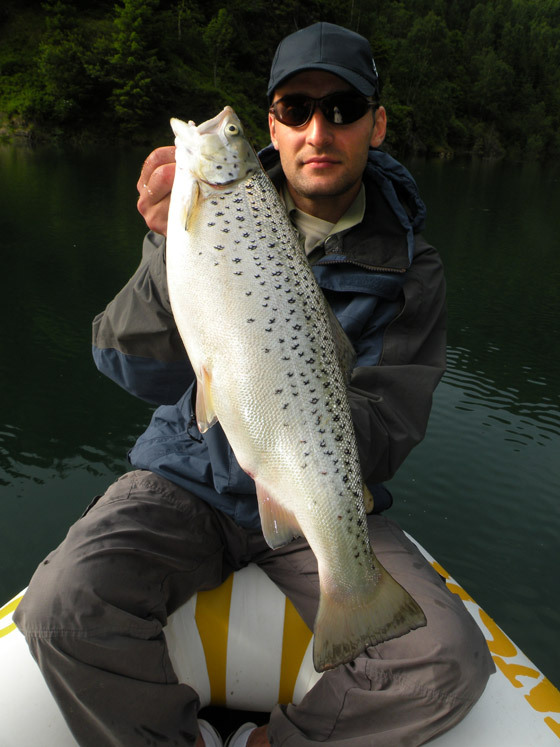 So, after returning home, all we had in mind was trout, and trying all the new techniques we’ve learned in Croatia. We only had one problem. Rain had been poring all over the country for about two weeks, and made all rivers and lakes nearby muddy. We needed a backup plan, and we needed it fast. 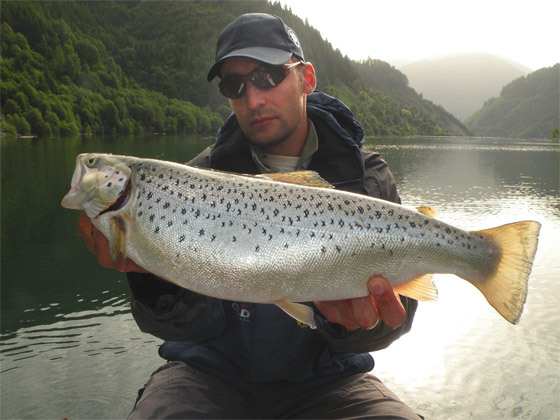 Andrei suggested we went trout fishing on a lake, near a famous natural park. Boat fishing was a must, as the water level was about 40 meters higher than usual, which made shore fishing near to absolute impossible. I’d rather not say how we arrived around 12pm, or that we almost drove into the lake because the road was engulfed by the water, or that pitching the tent was a bit tricky without a flashlight or the fact that we had only 3 sleep hours left till dawn, but that’s what really happened. 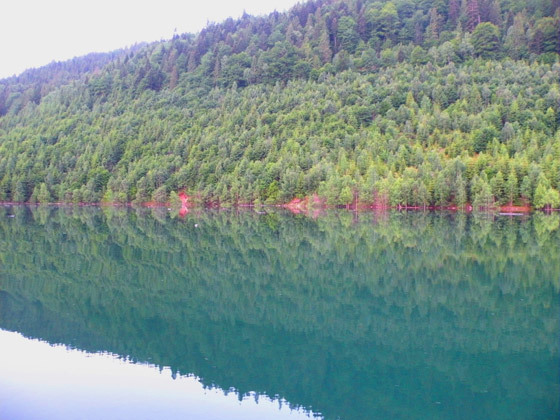 But, who cares about these details when you wake up in the morning, take a deep breath of fresh mountain air and in front of your eyes lies a beautiful lake surrounded by forest that’s filled with wild trout? We had a quick breakfast and jumped into the boat. For me, lake trout fishing was a new challenge. I only did river trout fishing so far, and lakes need a totally different approach. This is because of the huge water volume, which makes locating fish more difficult. Even when you located the depth where the trout is, they can be very selective when it comes to artificial baits and their underwater presentation. Also, the weather conditions can change all the variables in no time. So if you take all these into account, you quickly realize it’s impossible not to fall in love with this type of fishing, which pushes your fishing skills to the edge. We started fishing with different lures, and while I was fishing a spoon Andrei was fishing crankbaits and jerkbaits. We needed to explore different water depths and lure vibrations, in order to see where the trout are feeding. This seems a pretty simple and efficient strategy in theory, but practice doesn’t always agree. We had strikes at a water depth of 15 meters, and also just below the surface at 0.5-1 meter. The problem was that few of this strikes were decisive, allowing us to actually set the hook. The first day we managed to catch between 10 to 15 trouts, mainly between 1-2 lbs, but these weren’t the ones we were after. Besides, I really wanted to wrestle a big one. What I noticed was that the water surface was full of insects, and trout preferred them instead of our small fish imitation lures. So I switched to a small Salmo wobbler, Tiny model, which perfectly imitates a bug. I used this model before, but mainly when fishing chub. Now, I needed something that would make little noise when it falls on the water, and can wake trouts interest. Something very similar to an insect. After a few casts, we got to a great shadowed spot, with overhanging pine right over a cliff. It seemed like the perfect place for opportunistic trout that were just waiting for bugs to fall into the water. The Salmo Tiny fell near the cliff, and started its belly dance very close to the surface. In no time the Tiny lure was rammed by a big one, spectacularly jumping at least 4 feet out of the water. The strike was incredible, and the trout huge. It was show time! Because I was fishing a Light St. Croix 6’6” rod, with 2 lbs monofilament, it was very important no to rush and tire the fish using my rods action and the reel brake. Any fast movement could scare the fish and make him snap the 2lbs fishing line. Also, when you notice that the fish intends to jump, it’s important to keep the rod tip in the water, trying to force him to stay under. During these spectacular jumps, hook-offs are much more likely to happen. If you keep your calm, (yeah I know, pretty difficult when dealing with a potential personal record) and put constant pressure on the fish, you have a big chance of winning the battle. So, after an awesome fight, with some runoffs near the boat and the first half of my rod down underwater, I managed to bring the fish to the net for some great pictures. It was a beautiful 7lbs lake trout, which may not seem much, but for me it is a personal record and a big addition to my future lake trout fishing career. Soon after the catch, the weather quickly changed with a big storm approaching, so we had to stop fishing and start packing. But don’t worry, we’ll return soon, because now I have a new record to break! Professional angler, web enthusiast and tackle fanatic. Always in search for new things that can improve his fishing. This entry was posted in Featured, Fish and tagged salmo, salmo lures, salmo tiny, trout, trout fishing, trout lures. Bookmark the permalink. Post a comment or leave a trackback: Trackback URL.